TBEX Europe kicks off next week (Tuesday 3rd to Thursday 5th of October) in the Killarney Convention Centre / INEC, bringing together more than 600+ bloggers, content creators, influencers and travel marketing experts. I’ll be there for most of Wednesday and Thursday representing Travel Massive Dublin. 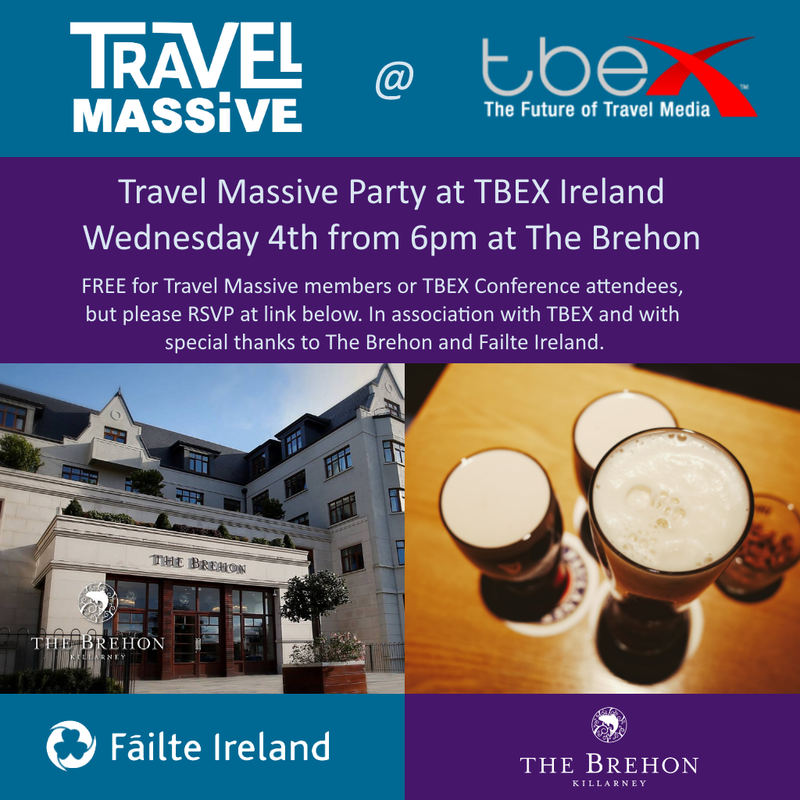 To mark a major event like TBEX coming to Ireland, Travel Massive in partnership with TBEX, Failte Ireland and The Brehon are hosting a party on Wednesday night, in The Brehon from 6 to 8 pm. There’ll be Irish music, Irish dancing, Irish beer and whiskey and a whole bunch of Irish and international travel industry people to meet. Best of all it’s FREE for either TBEX attendees or Travel Massive members. Note 1: Travel Massive membership is also free to anyone in the travel industry (including bloggers), but please complete your profile! Note 2: The beer probably won’t be free, unless we get a sponsor. Looks like we have a sponsor – more on that later – so probably the event will include a free drink for the first 100 or so to turn up. Right now we have 134 people registered!